Although the movie was too, too long (93 minutes) it was somewhat entertaining. 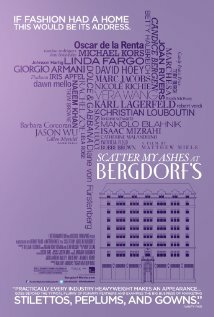 The movie provided the audience with a view of behind-the-scenes look at Bergdorf Goodman, the New York icon luxury department store noted for its upper class in fashion and style. There are some very funny stories told by fashion’s “biggest influencers” including Hollywood stars, Susan Lucci, Ashley Olsen and Mary-Kate Olsen, Candice Bergen, Michael Kors, Joan Rivers, just to name a few. I would recommend this movie for sheer entertainment especially if you are in need of a few laughs!